Although I’ve always quite thoroughly enjoyed music, I’ve never been talented enough to become famous. I most certainly can’t sing. As far as I can see, my main talents appear to lie in writing and public speaking. 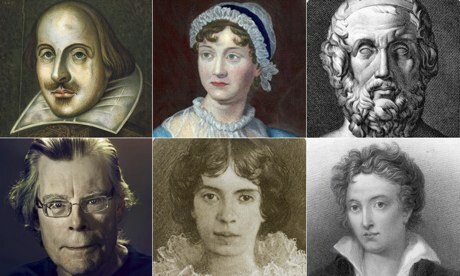 In spite of what people seem to think these days, all the great writers of yore were in the conservative tradition. Now in our modernist and post-modernist era people are entirely too smitten with things like semiotic deconstruction and other means of deception-a pox be upon you, Jacques Derrida! It’s most certainly not the least bit coincidental that Cervantes, Shakespeare and Milton are so often touted as the greatest of writers in the western canon. Each of them could tell quite an exceptional story. Each of them also put forth significant points about both human nature and the significant political, philosophical and social currents of his era, but in narrative rather than didactic form. They were very good at following Emily Dickinson’s rule about telling all the truth slant. If I were a writer I could get to know all the intellectual and literary figures who shape our current modes of thought. To my chagrin all my favorite public figures are those from the past. T.S. Eliot, Walker Percy, Graham Greene and Flannery O’Connor were among the very best of twentieth century writers. I don’t really know of anyone from this era who strikes me as especially good or interesting. Unlike a lot of great authors throughout history, I simply don’t have a healthy enough constitution to get away with their hard-drinking, hard-living behavior. Mine would have to be quite a quieter, less intense sort of lifestyle. I’ve always had quite a flair for the more comedic and lopsided side of life. It might be a really good idea, then, for me to emphasize all sorts of dysfunctionality in at least a few of the characters I may write about. I could take advantage of all sorts of ideas and literary traditions I’ve always really liked. Knowing me I’d have to write something in the style of either Cervantes’ “Don Quijote” or Jane Austen’s “Northanger Abbey”, each of which refers to other literary works within its story line. Each author seems to have his favorite kinds of symbolism to which he has frequent recourse. Graham Greene was fond of using hard-drinking alcholics among his most prominent characters. Emily Dickinson and T.S. Eliot were known for their Sanjuanist themes. I often think I could do quite well at public speaking too. Of course I should have to be a lot more knowledgeable than I am currently but with a little extra effort I honestly believe that I could do quite an effective job of arguing my side of any subject. Nothing has ever been able to stop me from arguing unofficially anyway. In college classes I’ve taken, I’ve always struck my classmates and professors as quite a formidable opponent in a debate. Under those circumstances I can suppose that I should be the same, in didactic form, as I should be in a narrative sense, with my writing. The humanities have always been my favorite intellectual discipline. Whenever I get into a significant debate about matters of either a theological or philosophical nature I get exactly as exceptionally enthused as I do about classic western literature. Our current cultural climate is quite seriously disturbing and someone simply must speak out against the way things are going now. We need as many people as possible, these days, who are both willing and competent to defend traditional western cultural mores from the absolutely insatiable leftist determination to control us all. My imagination, combined with my understanding of reality, and a determination to get my point across to people, could really make quite an impact if I were famous.